With school starting soon, I’ve been itching for some new home office organization systems–there’s just something about fall that makes me want to buy fresh new binders and recycle everything I don’t need anymore. One of the things I’m craving is a big planning wall calendar. 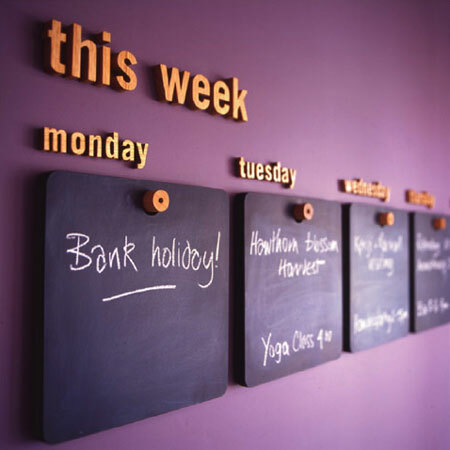 I’ve been gathering wall calendar inspiration, and today, I have three chalkboard style calendars to share with you. First up, we have a gridded, painted calendar from Martha Stewart. It’s got a great blend of sleek and rustic, doesn’t it? Just enough texture to be interesting, and the straight lines keep it looking orderly. Next, is this one-week calendar which is simply hung on the wall. This would be a great option for renters, or for people who don’t want the hassle of painting over chalkboard paint. I don’t really find a weekly calendar to be very helpful (I need to see my schedule further out to feel really organized), so if I go with this one, I’ll probably make a month’s worth of squares instead of just 7. I really like the way Holly framed out her chalkboard for her command center. Plus, the tags add a unique, attractive touch. This version probably comes the closest to what I was looking for when I first started my search–it has a rustic charm, and enough polish that it would work well in many home offices (including mine!). 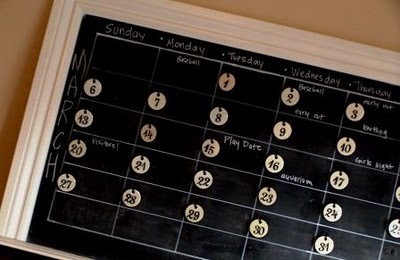 The drawback of chalkboard wall calendars, though, is that there’s all that dust involved. Of course, that they’re easily erased is both good and bad. So, I’m not completely sure this is the right approach for my office. Lucky for me, there’s plenty more inspiration out there, so stay tuned for another roundup or two of what else I’m considering for creating a big wall calendar in my office. Hi lovelies! I’m so excited to get to share with you photos and tutorials from my branding expert (and the brilliant designer behind both OriginalFlavor GirlyPC.com and our new look) Jessica Albon’s home office project. She wanted a new look for her room that was cozy and colorful, but not overwhelming and that made great use of her large office space. So, together, she and I mapped out a plan, and she agreed to walk you through exactly what she did to make the office look great and function even better. Today, she’s going to introduce you to her office and tell you a bit about the before. In future posts, she’ll tell you about the projects she tackled. My office has lovely patio doors. They’re all glass, and let in tons of light. The view wasn’t perfect (partly driveway, partly pretty backyard). Unfortunately, they’re also really visible to the street which means door-to-door sales people and evangelists always come to that door. And I couldn’t hide out (say, if I was on the phone with a client and really didn’t want to tell an evangelist that yes, my call was more important than his desire to save my soul) because they could see right in. So, in order to feel really productive and comfortable in my office, I had to address those doors. And I had to do it in a way that blocked as little light as possible. But I had one more challenge to consider: a dog who LOVES looking out the doors at the squirrels and neighborhood cats and who pulled down any curtains I tried to hang, and managed to drool all over the window in between the slats of the (original to the house) wood blinds that had been installed. So, it was a problem. I needed tons of privacy without blocking light, and it all had to be super dog-friendly. Plus, I wanted it to be removable should I ever change my mind. I thought about using a contact paper on the windows, but what I read of the installation and the removal didn’t thrill me. Plus, the designs I found were mostly pretty tacky or very solid and neither felt quite right. So, I kept searching, and luckily came across Valspar’s “Frosting Interior” for glass at Lowes. That seemed perfect since it meant I could easily apply it precisely where I wanted it. When it came to a design, I decided to keep things really simple. I’d never used spray paint on glass before and didn’t want to bite off more than I could chew. Plus, I have a lot of projects to tackle. 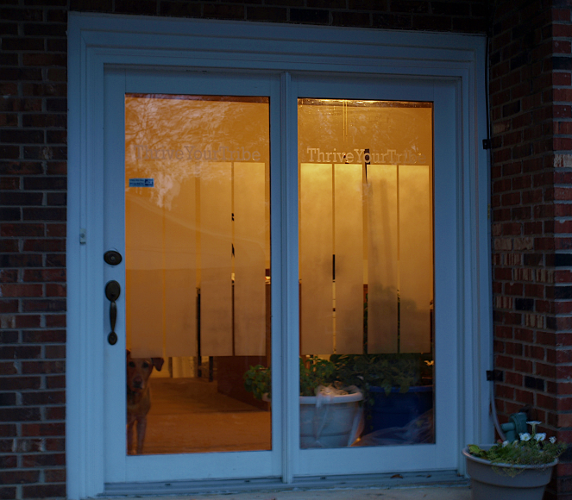 So, I masked off four simple long skinny rectangles per door, leaving both the bottom and the top of the glass clear. 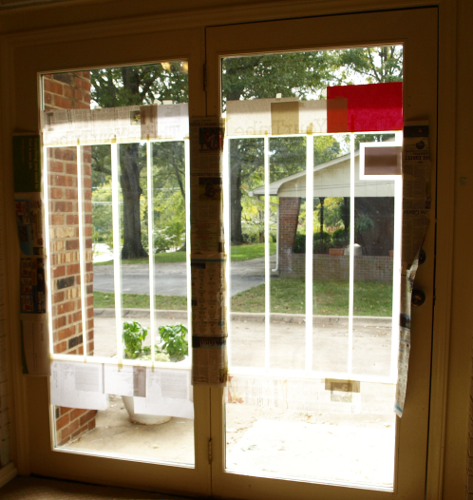 I applied two coats of the frosted glass spray paint and pulled off my tape immediately following the second coat. Getting the masking tape straight took longer than I anticipated. Finally, I’m ready to spray. Don’t be afraid of a simple design. I spent about a week trying to figure out what design to put on the doors. I thought about everything. And, in the end, I really like the simplicity of the rectangles. The reason I didn’t just spray one rectangle per door was that I wanted some visibility so that I’d be able to see who was at the door (the spray really does obscure your view). The paint does filter light, but not nearly as much as I’d worried it would. If you have that same concern, go for it! Give it a try and see if you like it. The glass frosted spray paint isn’t particularly expensive, and it scrapes off really easily, so if it’s just a matter of not knowing whether or not you’ll like it, I’d definitely recommend you dive in and try it out for yourself. Buy more than you think you’ll need. I wound up only using one bottle, and still have quite a bit left in that bottle. But, it would have been really frustrating to run out halfway through, so I’m glad I bought two just in case. Plus, it was so easy to use, I think I’ll be using my spare bottle on other projects around the house. Stay out of the area for several hours. In my case, I had to stay out of the office for the entire day–the fumes gave me an intense headache. So, don’t apply the paint at the beginning of a day when everyone will be hanging out in that room later in the day. Give it a full 24 hours at least so that you have time to air out the room. I couldn’t be happier with the change–it’s given me the privacy I wanted, and Izzy (my dog) can still see everything. Plus, it looks lovely from both the inside and out and isn’t too modern for my home’s brick exterior. So, my first step was to pull out the closets and pull down the paneling. Even with lots of help, these two tasks took about two weeks. 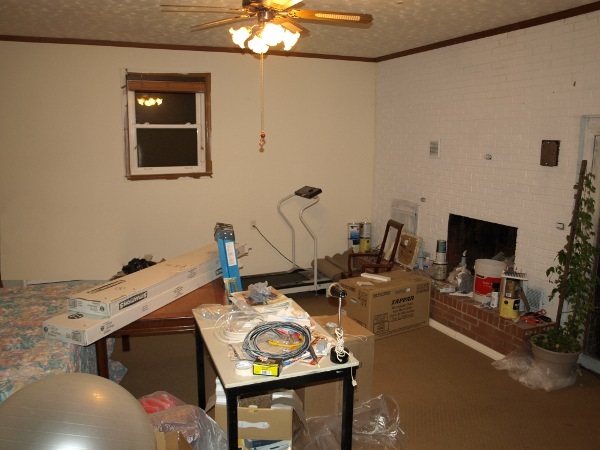 Then, the whole office was painted a cream color–ceiling and walls. I really like that the color is light and airy, but warmer than white. On the downside, I chose a matte because the walls are in rough condition (which was probably why the original owners had added the paneling!) and so the effect is a bit darker than I’d hoped. You can see the new carpet in the photo, too, but what you can’t see is that I left the original (filthy) Berber carpet on the stairs… When the room was a garage, it had concrete stairs going out of the garage and into the house. When they installed the Berber carpet, they glued it down to the stairs. After having tackled lots of other projects in the house, I was convinced the carpet was going to be a nightmare to get off the stairs (whenever possible, the original homeowners used the strongest glue they could find–which was great for longevity, but made removal… not so great). So, I left it. For about six months. Then, Jessica Zee came for a client meeting about her website. Other than the eyesore stairs, my office was in “pretty good” shape. But, she knew it could be better. So, she challenged me to shape things up and make the office reflect my style as a designer. Alas, under the carpet, the concrete stairs were in worse shape than I’d anticipated. They’re *really* uneven (to the point where part of a step is missing–I always wondered why I slipped if I stepped on that stair wrong, and now I know–there was no concrete under the carpet in that spot, just air!). Also, prior to the Berber carpet, the stairs had been covered first in glued-down carpet and then in glued-down carpet padding. I got up as much of it as I could, but eventually was doing more harm than good and so I figured I’d let the paint hide the rest of the flaws. Of course, little did I know that painting concrete stairs was going to require TEN coats of various products. (Which meant nearly 20 days that the stairs couldn’t be walked on.) But that’s a story for part two of this home office makeover.